Kiwi startup New Culture is developing lab-grown mozzarella - or as it prefers to style it "fresh mozzarella, no animals required". "We are making cow cheese without the cow," founder Matt Gibson says. "If you have ever talked to a vegetarian or a 'flexitarian', you'll commonly hear that the number one thing stopping them from going vegan is cheese," he says. "There is an unmet need right now for good-tasting vegan cheese and these conscious consumers and plant-based consumers will be our first market. Afterward, we want to capture the mainstream dairy cheese consumer market with 'cheese' that will be better both in taste and function compared with current dairy cheese." What the Impossible Impossible Burger is to beef, and Sunfed is to chicken, New Culture wants to be to cheese. Gibson relocated from Auckland to California in February, having won backing from IndioBio - a San Francisco-based incubator that specialises in "future food" and includes the high-profile, cell-based steak maker Memphis Meats in its stable, among many others. IndieBio has chipped in US$200,000 in pre-seed funding, and Gibson says he's also finalising US$125,000 from an international VC. After that, he plans to raise US$1.5 million to develop a pilot production process and expand his team (which currently consists of two PhDs: California native and biotech veteran Arie Abo and Inja Radman, a Croatian who arrived in San Francisco via Cambridge University). A commercial product is still a couple of years of R&D and FDA testing away, Gibson says. Assuming it all works out and his artificial mozzarella gets on to shop shelves, does Gibson anticipate the sort of backlash that hit Air New Zealand from the beef and lamb industry and some conservative MPs after it trialled the Impossible Burger on Auckland-San Francisco flights? "I think that will be likely," Gibson says. "New Zealand has a rich history in dairy and farming and our economy is heavily reliant on our dairy exports. "But with the threat of global warming, the world's rising population and the need for secure and sustainable food, we need to be able to look more then a few years into the future and think of how our planet will be affected in 50 years' or 100 years' time if we don't move towards a more efficient way to produce food." That argument has been used by a number of commentators, but Gibson's language is still guaranteed to wind up Fonterra and other incumbents - for example, when he refers to his class of product as "clean diary" and the Impossible Burger as "clean beef" rather than artificial beef. And New Culture's choice of mozzarella as its first product could be a sore point with Fonterra, which recently spent $240 million on a new plant at Clandeboye in South Canterbury devoted to the high-end cheese. Gibson says New Culture has no direct competitors or at least none who are funded. "There are a lot of purely plant-based vegan cheeses out there and some great vegan cream cheeses, but we don't see these companies as competitors as we are working on the more structured and hard cheeses which plant-based cheeses can't really match," he says. What is New Culture's secret sauce, so to speak? "We are taking the essential proteins that give dairy cheese its unique properties and, like what the Impossible Burger does with the heme protein, we are sustainably producing these proteins ourselves with the help of microbes," Gibson says. "From there, we add plant-based lipids, sugars and minerals to make a vegan cheese that has all the properties of dairy cheese without any of the unsustainable and unhealthy drawbacks. Our first product is fresh Mozzarella." B.Sci grad and eight-year vegan Gibson studied genetics and microbiology at Auckland University before detouring into a broadcast engineer role at MediaWorks then a blockchain startup before returning to his first passion. What made him apply to IndieBio in San Francisco? "When I knew I wanted to contribute to this future food movement, the first place I thought of was IndieBio," Gibson says. "IndieBio is the world's largest biotech accelerator program and has already helped companies such as Memphis Meats, Finless Foods, New Age Meats, NotCo and a bunch of other fantastic future food companies turn their ideas into world-changing businesses. 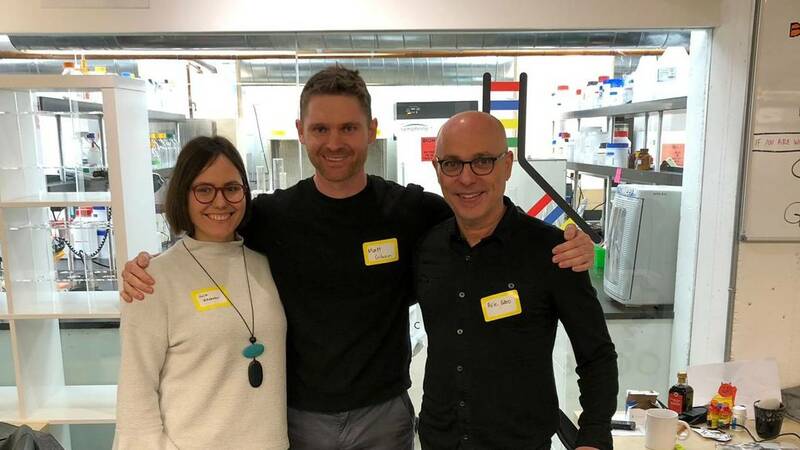 "After meeting my co-founders and making some prototypes back in New Zealand - which I sent to IndieBio as part of the application - we applied at the start of this year and were accepted, being the first New Zealand-led company to be accepted into IndieBio." Gibson says New Culture is still around two years from having a product that consumers what to buy. One the big hurdles will be producing at volume, but Gibson reckons he has that one cracked - on paper at least. "We believe we have developed a new process that will enable us to scale much more quickly compared with other companies in this space. But even still, there is a lot of work to get to a scale for commercialisation," he says. Some of it has been low-tech. Gibson brought in a local cheese expert, Sacha Laurin, to teach the New Culture crew how to make traditional mozzarella - the better to get a total understanding of the traditional product before they replicate it in animal-free form. There's another reason that Silicon Valley-adjacent InideBio is a good location. "Our first market will be America because it's one of the largest cheese consumers per capita," Gibson says. He's not willing to have a punt on pricing yet. But New Culture does have a "taste list" on its website where you can put your name on a waiting list to be among the first to taste its "mozzarella".